For testing, temperature indicating paint was applied to the part, which melts when the part reaches the targeted temperature. Testing showed that it took 5.0 seconds to heat the sample to temperature. After the part cooled to room temperature, it was compared to client-provided finished assemblies to confirm that the plastic was sufficiently bonded to the inside of the steel tube. Five assemblies were heated by THE LAB at Ambrell and the application was successfully proven out. Repeatability was critical for the client's application, and induction from Ambrell is highly repeatable. 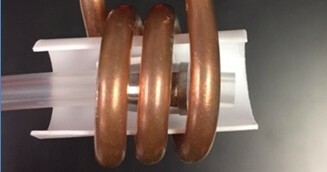 The speed and precision of induction heating was also important to the client, which THE LAB proved induction could deliver. The EASYHEAT's modest size also fits nicely into the client's manufacturing process, and the EASYHEAT's reputation plus the fact it's built at Ambrell's Scottsville, NY USA headquarters were also deciding factors. Click here to learn about other bonding application processes that THE LAB at Ambrell has designed. Interested in getting your application tested by THE LAB? Just fill out this form to get started!